Stirling Albion cemented their League One play-off final spot with a comfortable aggregate win over Annan, who were reduced to 10 men at Galabank. 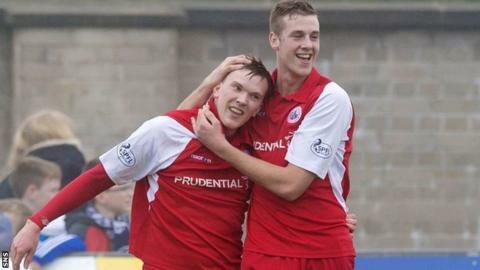 The Binos' progress to a two-leg tie versus East Fife is largely thanks to Jordan White's hat-trick. David McClune and Craig Comrie netted the others for the visitors. Annan, for whom Martin McNiff, Ally Love and Scott Davidson all scored, had looked in contention until McNiff's sending off on 52 minutes. His second yellow card dented any real hopes of the hosts' comeback as Annan's chances of progressing from the fourth tier for the first time crumbled. Greig McDonald's Stirling, who are looking to return to the third tier following two seasons in the bottom division, started quickly in front of a crowd of 912 in the sunny border town. Former St Johnstone and Falkirk winger David Weatherston twice sent excellent low crosses from the right for McClune and then White to turn home. Jim Chapman's Annan were far from out of it and Kenny MacKay's thundering strike off the underside of the bar showed The Black and Golds had more to offer. They pulled a goal back before the break when McNiff's header squeezed past David Crawford, then Love drove a sweet left-footer low into the far corner to equalise soon after the restart. However, referee George Salmond dismissed McNiff when the 25-year-old caught Comrie. From there, Stirling were in control and Comrie fired a crisp low strike beyond Kenny Arthur from the edge of the box to ease any nerves. White met a low cross well to finish expertly for his second and was on hand to turn in from close-range soon after to complete the hat-trick and take his tally to 22 for the season. Former Albion man Davidson shot well past Crawford following a mazy run in injury time to reduce the deficit, but many home fans had left prior to that. Match ends, Annan Athletic 3, Stirling Albion 5. Second Half ends, Annan Athletic 3, Stirling Albion 5. Goal! Annan Athletic 3, Stirling Albion 5. Scott Davidson (Annan Athletic) left footed shot from the left side of the box to the top left corner. Attempt missed. Ross Forsyth (Stirling Albion) right footed shot from the right side of the six yard box is too high. Corner, Stirling Albion. Conceded by Iain Chisholm. Attempt missed. Dale Fulton (Stirling Albion) right footed shot from outside the box is high and wide to the right. Attempt missed. Ross Forsyth (Stirling Albion) header from very close range is too high. Corner, Stirling Albion. Conceded by Steven Swinglehurst. Foul by Scott Davidson (Annan Athletic). Chris Smith (Stirling Albion) wins a free kick in the attacking half. Goal! Annan Athletic 2, Stirling Albion 5. Jordan White (Stirling Albion) right footed shot from the right side of the six yard box to the top right corner. Attempt saved. Mark Ferry (Stirling Albion) right footed shot from the centre of the box is saved in the top centre of the goal. Attempt saved. Scott Davidson (Annan Athletic) right footed shot from the right side of the box is saved in the centre of the goal. Substitution, Stirling Albion. Mark Ferry replaces David Weatherston. Goal! Annan Athletic 2, Stirling Albion 4. Jordan White (Stirling Albion) right footed shot from the centre of the box to the bottom right corner. Attempt saved. Blair Henderson (Annan Athletic) right footed shot from the centre of the box is saved in the bottom left corner. Corner, Annan Athletic. Conceded by Chris Smith. Andrew Mitchell (Annan Athletic) wins a free kick in the defensive half. Foul by Ally Love (Annan Athletic). Dale Fulton (Stirling Albion) wins a free kick in the defensive half. Substitution, Annan Athletic. Blair Henderson replaces Josh Todd. Substitution, Annan Athletic. Scott Davidson replaces Steve Sloan. Ally Love (Annan Athletic) is shown the yellow card. Graham Weir (Stirling Albion) wins a free kick in the defensive half. Attempt missed. David McClune (Stirling Albion) header from the centre of the box misses to the left. Corner, Stirling Albion. Conceded by Steve Sloan. Substitution, Annan Athletic. Chris Jardine replaces Peter Watson. Hand ball by Kenneth Mackay (Annan Athletic). Attempt missed. Graham Weir (Stirling Albion) left footed shot from outside the box is just a bit too high. Corner, Stirling Albion. Conceded by Peter Watson. Corner, Stirling Albion. Conceded by Kenny Arthur. Attempt saved. David Weatherston (Stirling Albion) right footed shot from outside the box is saved in the top left corner. Corner, Annan Athletic. Conceded by Craig Comrie. Ross Forsyth (Stirling Albion) is shown the yellow card. David Hopkirk (Annan Athletic) wins a free kick in the attacking half.